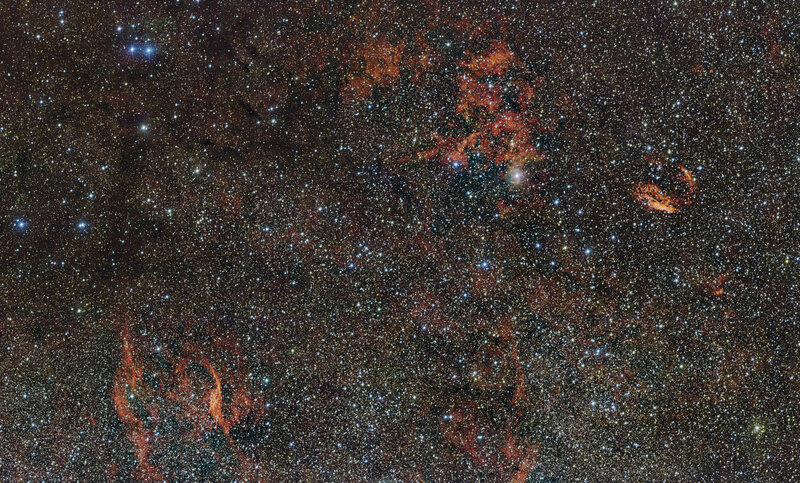 This new ESO VLT Survey Telescope image shows the vast nebula where giant stars were born, known as RCW 106. The brightest part appears just above the center of the image. 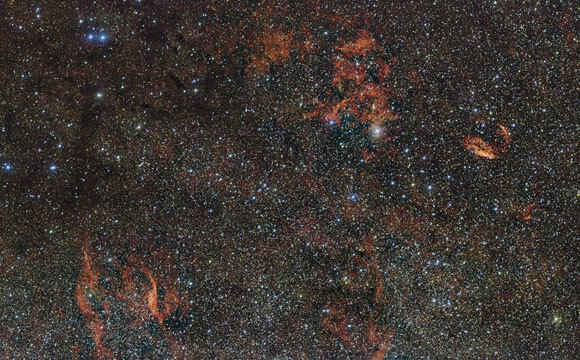 In this huge new image clouds of crimson gas are illuminated by rare, massive stars that have only recently ignited and are still buried deep in thick dust clouds. These scorching-hot, very young stars are only fleeting characters on the cosmic stage and their origins remain mysterious. RCW 106 is a sprawling cloud of gas and dust located about 12,000 light-years away in the southern constellation of Norma (The Carpenter’s Square). The region gets its name from being the 106th entry in a catalog of H II regions in the southern Milky Way. H II regions like RCW 106 are clouds of hydrogen gas that are being ionized by the intense starlight of scorching-hot, young stars, causing them to glow and display weird and wonderful shapes. RCW 106 itself is the red cloud above center in this new image, although much of this huge H II region is hidden by dust and it is much more extensive than the visible part. Many other unrelated objects are also visible in this wide-field VST image. For example, the filaments to the right of the image are the remnants of an ancient supernova, and the glowing red filaments at the lower left surround an unusual and very hot star. Patches of dark obscuring dust are also visible across the entire cosmic landscape. Astronomers have been studying RCW 106 for some time, although it is not the crimson clouds that draw their attention, but rather the mysterious origin of the massive and powerful stars buried within. Although they are very bright, these stars cannot be seen in visible-light images such as this one as the surrounding dust is too thick, but they make their presence clear in images of the region at longer wavelengths. For less massive stars like the Sun the process that brings them into existence is quite well understood — as clouds of gas are pulled together under gravity, density and temperature increase, and nuclear fusion begins — but for the most massive stars buried in regions like RCW 106 this explanation does not seem to be fully adequate. These stars — known to astronomers as O-type stars — may have masses many dozens of times the mass of the Sun and it is not clear how they manage to gather, and keep together, enough gas to form. O-type stars likely form from the densest parts of the nebular clouds like RCW 106 and they are notoriously difficult to study. Apart from obscuration by dust, another challenge is the brevity of an O-type star’s life. They burn through their nuclear fuel in mere tens of millions of years, while the lightest stars have lifetimes that span many tens of billions of years. The difficulty of forming a star of this mass, and the shortness of their lifetimes, means that they are very rare — only one in every three million stars in our cosmic neighborhood is an O-type star. None of those that do exist are close enough for detailed investigation and so the formation of these fleeting stellar giants remains mysterious, although their out-sized influence is unmistakable in glowing H II regions like this one. Be the first to comment on "The Realm of Buried Giants – Star Formation Region RCW 106"